The first half of 2018 proved that clinical drug diversion continues to threaten the ability of healthcare organizations to provide high-quality patient care and to ensure safe medication administration. Earlier this year, Protenus’ independent research team published a report of our 2017 findings on this topic, which included a detailed explanation of the report’s full methodology and scope. The first six months of 2018 offered a means to compare and contrast the current landscape to what the 2017 data revealed. In this report, we’ll examine possible explanations behind the continuities and evolutions we observed. Our analysis is based on 179 total incidents of medication tampering, fraud, and theft reported in the news from January 1, 2018 through June 30, 2018. We know that this aggregation reflects just the tip of the iceberg, representing only a limited set of diversion events carried out by healthcare workers during this time period. Subscribe to the Drug Diversion Digest to receive this report as soon as it is published. Data on the type of site where the diversion incident occurred was available for 160 of the 179 total incidents. 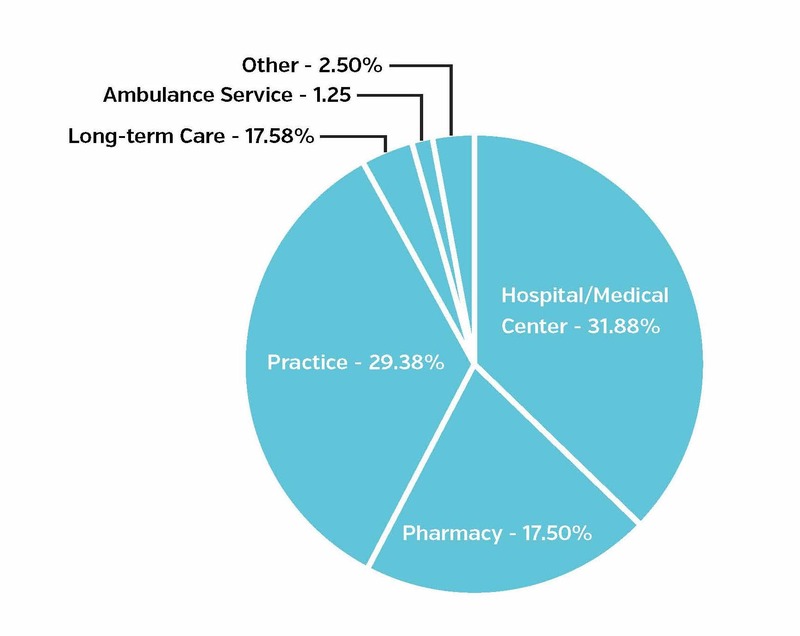 31.88% of diversion incidents occurred in a hospital or medical center setting, a slight drop from the 37.25% of incidents reported in this setting in 2017. The private practice setting followed closely behind, with 29.38% versus 16.67% last year. The third most common site was pharmacies at 17.50%, up 4% from last year. It’s particularly interesting that practices and pharmacies were the sites of a greater number of diversion incidents so far in 2018 when compared to 2017. In October of 2017, the DEA announced its plan to “step up investigations of pharmacies and doctors found to be dispensing or prescribing suspicious amounts of opioid pain medication.” Pill mills are one mechanism for diverting drugs. They commonly take place within the practice or pharmacy settings because they're often led by doctors or pharmacists, making them unsurprising targets of increased scrutiny and attention from drug enforcement officials. We will continue to monitor how this trend evolves throughout the remainder of 2018. In addition to the type of organizations where incidents occur, it’s important to acknowledge the various costs that diversion incidents can inflict upon organizations. Two measurable costs include the number of pills and dosages and the amount of money lost to an organization. Our money lost metric is quantified by the cost of diverted drugs or the cost billed to insurance in fraudulent prescriptions. In the first six months of the year, there were 32 incidents in which the amount of pills or dosages lost due to diversion was available. So far in 2018, there have been 18.7M pills or dosages diverted by healthcare employees, compared to 20.9M pills or dosages reported in the 2017 report. It’s important to note that the number of prescriptions were not included in this analysis. The crackdown on pill mills, a type of diversion that often involves the prescription of large volumes of pills - frequently in the thousands or even millions - over long spans of time for no legitimate medical purpose is a possible explanation for this substantial increase in number of pills and dosages diverted. Diversion activity also has a tremendous impact on a healthcare organization’s bottom line and reputation. Of the 179 incidents, $162M worth of diverted drugs was reported among 23 separate incidents. 2018 is set to surpass last year’s total of $301.1M worth of diverted drugs if this trend continues throughout the remainder of the year. While the data collected for this report does not include settlement costs, like other costs incurred from diversion events, they also affect an organization’s bottom line. In May of 2018, a Georgia health system agreed to pay a $4.1M civil penalty, making it the largest diversion settlement ever paid by a health system in history. The organization failed to provide effective controls and procedures to guard against the theft and loss of controlled substances, and as a result, experienced an incident involving a significant diversion of tens of thousands of Oxycodone tablets over more than a four-year period. In August of 2018, this settlement was upended as the largest in history when a leading health system paid a $4.3M settlement for diversion-related activity. These record-setting penalties set new precedents for what drug diversion incidents could cost a healthcare organization. Data is available on the role of diverters for 100% of incidents included in this report. So far in 2018, doctors were involved in 42.46% of diversion incidents, making them the most common diverters, compared to 26.32% in 2017. Nurses were involved in 28.49% of incidents, positioning them as second most likely, as compared to 41% in 2017. This denotes a sizable shift as doctors and nurses seem to have switched ranking in terms of which role is most likely to divert controlled substances in healthcare. The same reasons nurses divert medication are also true for physicians. The high stress of the profession, long shifts, fatigue, physical and emotional pain, along with easy access to controlled substances, contribute to why these roles are likely to divert controlled substances. As noted above, the DEA’s focus on pill mills, which are most often run by doctors due to their prescribing power, might help to explain this shift. Pharmacists and pharmacy technicians accounted for 16.20% of incidents, which is a slight increase from the 11.91% in 2017. The capability of new platforms to audit every transaction that occurs within an automated dispensing system can help organizations understand who is at highest risk for diverting drugs, allowing them to better proactively target these groups with prevention measures, or immediately detect diversion activity right when it starts, minimizing the amount of harm imposed upon everyone. Just as organizations face consequences, so do the workforce members responsible for the diversion in potential jail time and fines. In the first half of 2018, the average jail time was 35.21 years, which does not account for incidents with a possible life sentence or cases with press mentions that noted a string of possible sentencing times for each charge rather than a total potential sentence. Data was available on potential jail time for 32 incidents. The maximum potential jail sentence was 390 years for a case involving a doctor who prescribed Hydrocodone outside of the bounds of legitimate medical practice and 340 years for a case involving a group of doctors who ran a pill mill. If these two numbers, which represent outliers, are excluded, the average sentencing time drops to 15 years, which is more aligned with the 11.21 years average that we observed in 2017. The average fine for diverters was $681,582, more than tripling the average fine of $213,858 in 2017. This is based on data available for 16 incidents, and the average is much higher than the median fine of $250,000. The highest potential fine was $5M for a doctor indicted on 20 counts to distribute Schedule II controlled substances, including Hydrocodone, outside the bounds of legitimate medical practice. This $5M represents an outlier in the dataset and if it’s excluded, the average fine is $393,687, which is closer to median and the $201,776 average fine we saw in 2017. While these measurable costs are striking, the loss of trust between the provider and their patients, although difficult to quantify, should not be forgotten. Trust is central to any patient-provider relationship, and when it is broken, it can have long-lasting and even irreparable repercussions. Drug diversion poses a great deal of harm to patients, putting them at risk of being treated by care providers who are under the influence of controlled substances or receiving the incorrect amount or type of medication(s). While essentially all drug diversion cases involve some sort of drug theft, many cases in 2018 have involved healthcare workers physically stealing pills, resulting in patients receiving lower amounts of the prescribed medication or receiving the wrong drug altogether. Some cases even resulted in fatalities. A physician in Jefferson County, MO was charged with overprescribing opioids that caused the overdose of two patients, one being fatal, who had been struggling with Oxycodone and Fentanyl addictions since 2015. In another case, a doctor prescribed Hydrocodone without a legitimate medical reason over a four year period to individuals who were recruited to pose as patients. This doctor also wrote prescriptions for “patients” who were dead or in jail. For example, he prescribed Hydrocodone to a deceased patient five times after their death in 2015. The longer that incidents of drug diversion go undetected, the greater potential there is for patient harm. The average time a drug diversion incident occurred before being detected was just over two years (24.33 months). The longest incident so far in 2018 went undiscovered for 120 months, involving a pain management doctor pocketing nearly $14M from a pill mill operation between 2008 and 2018. The states found to have the most diversion incidents in the first half of 2018 were Pennsylvania (20 incidents), Michigan (19 incidents), and Florida (13 incidents). All three of these states were included in a new DOJ-led initiative that assigned Assistant US Attorneys to twelve states for a three-year term. The AUSAs are to focus solely on investigating and prosecuting healthcare fraud including “pill mill schemes and pharmacies that unlawfully divert or dispense prescription opioids of illegitimate purposes.” While it’s expected that these states will see a spike in the number of diversion incidents they experience in the short-term, only time will tell if this effort ultimately leads to a reduction of incidents in the long-term. In the inaugural Diversion Digest, three recommendations were made for how health systems can build more effective diversion monitoring programs: take an interdisciplinary approach, build a culture of awareness, and use AI-powered technology. There appears to be a growing focus on the use of data analytics to identify real incidents of diversion. For example, the DEA is taking steps to bolster the use of data analytics to determine where it should be targeting its investigations and allocating resources. The agency collects data from manufacturers and distributors of prescription drugs to find patterns, trends, and statistical outliers in the data. Last August, DOJ leaders ordered the formation of a new data analysis team - The Opioid Fraud and Abuse Detection Unit - to focus on opioid-related healthcare fraud. This team mines the data, looking for doctors who are prescribing suspicious amounts of opioids. As we noted in our inaugural report, technology alone will not stop diversion, but, at its best, it can proactively and accurately present natural-language cases to diversion teams, saving them time and allowing them to focus on real incidents of diversion rather than false positives. Automated reporting can have information on cases brought to your attention rather than necessitating hours of work assembling disparate information and gathering facts. A case-based approach enables organizations to audit 100% of controlled substance transactions, ensuring that nothing goes unnoticed. Until every transaction is analyzed, potential harms to providers and patients will remain widespread. Proactive analytics give teams an unprecedented ability to understand every provider’s normal vending behavior in order to recognize anomalous behavioral patterns. These insights can allow teams to detect certain types of diversion activity that were impossible to detect using less advanced technologies. These solutions analyze transaction information in real-time. Catching incidents early-on before they harm the diverter or patients is critical for keeping providers and patients safe. These sorts of technologies have the potential to reduce detection times from months or even years, as this report discloses, to minutes. With new record-breaking penalties imposed upon a health systems earlier this year, it’s clear that now more than ever, organizations must take steps to detect and stop diversion in order to protect not only their patients, but also their organizations. 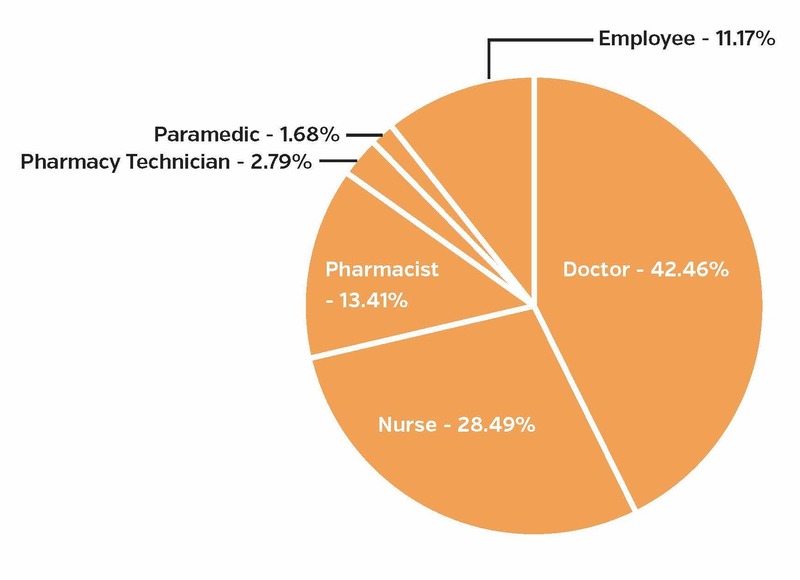 Involved a healthcare worker being discovered, reported, charged, arrested, or sentenced for drug diversion activity in 2018. Incidents where someone was arrested, indicted, charged, or sentenced prior to 2018 were not included in the report even if there were news articles published about them in 2018. Jail time: Jail times included in our report encompass real or potential sentencing lengths imposed upon diverters. Incidents explicitly noting the total possible or real sentencing length were included. Incidents providing potential sentences for a number of individual charges were excluded. Fines: Fines included in our report encompass real or potential fine amounts imposed upon diverters. Incidents explicitly noting the total possible or real fines were included. Incidents providing potential fines for a number of individual charges were excluded. Pills and dosages: Incidents reporting the total amount of lost pills or dosages were included. When a possible range was noted, the average of the two numbers was used. Numbers of vials or prescriptions were excluded due to the range of quantities that these might refer to. Worth of diverted controlled substances: Incidents reporting the total worth of the diverted controlled substances diverted were included. When a possible range was noted, the average of the two numbers was used. Incidents noting the worth of the controlled substances specifically on the black market were not included. Healthcare worker role: For cases involving numerous individuals occupying a variety of healthcare roles, the role of the incident leader or specific role of the charged individual was included. Disclaimer: This report is made available for educational purposes only and “as-is.” Although we have tried to provide accurate information, as new information or details become available, any findings or opinions in this paper may change. We welcome feedback as well as additions of incidents we might have missed. Despite our diligent efforts, we remain convinced that the incidents included in this report are only the tip of a very, very large iceberg, and any patterns we see in publicly disclosed incidents may not mirror what goes on beneath the tip. The Protenus healthcare compliance analytics platform uses artificial intelligence to audit user behavior in electronic health records and pharmacy systems for the nation’s leading health systems. Providing healthcare leaders full insight into how health data or controlled substances are being used, and alerting the right team of this inappropriate activity, Protenus helps our partner hospitals make decisions about how to better protect their data, their patients, their workforce, and their institutions. Learn more at protenus.com and follow us on Twitter @Protenus.